The limits of goodness: Duska Radosavljevic writes on a staging of Brecht by Moscow Pushkin Drama Theatre. 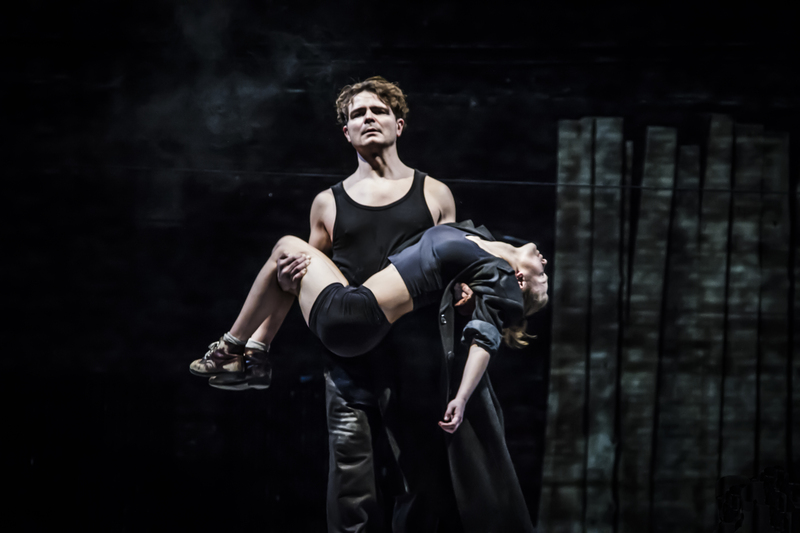 At the first glance, the distance between a British audience and this contemporary Russian production of a 1940 play by Bertolt Brecht written in America and set in China, seems hopelessly immense. The piece, presented as part of the Moscow Pushkin Drama Theatre season at the Barbican, opens on a desolate, post-apocalyptic black and white set, littered in debris and guarded, for some reason, by five life-size clay figures of canines. Brecht’s Waterseller Wong, the mediator of the Gods who leads us into the story, is portrayed by Alexander Matrosev with ostentatious virtuosity as a cross between a supernatural being and a village idiot – his elective, Brechtian depiction of disability inadvertently ringing the alarm bells of political correctness here. Alexandra Ursulyak’s first appearance as prostitute Shen Te, tottering ungracefully on sky high stilettos, donning a shiny black mac and torn fishnets, hints at a further sense of parody rather than either a radical challenge to realism or a discernible attempt at Brechtian estrangement. Even the first few songs of the show, accompanied live by an onstage orchestra, seem tentative, unconvincing, borderline off key. There are dense surtitles in English for the sections spoken in Russian, slightly more sparse surtitles in Russian for the songs rendered in German. The stage is busy, the pace is slow, the night is set to be long. Three hours twenty minutes, to be precise. Butusov’s direction is measured, inspired and assured. He follows Brecht’s text relatively closely, though not at all slavishly. For those who need a reminder, The Good Person of Szechwan is a dialectical parable about goodness – a distant antecedent perhaps to Michael Schur’s fantasy sitcom The Good Place – in which the gods conspire to test the limits of goodness in the one and only good person that they could find in China. This person is the prostitute-turned-tobacco seller Shen Te, who, finding it difficult to protect her boundaries, resorts to inventing a male alter ego, cousin Shui Ta, and uses his shrewdness to put her affairs in order. Things get difficult when Shen Te falls in love with a man – a wannabe pilot – who abuses her kindness and fails to return her love. Designed to defy Aristotle, Brecht’s play is fragmentary, episodic, and geared towards a finale that will put the protagonist on trial before both the gods and the audience. Butusov doesn’t rush to get us there however. Instead he builds his heroine’s case with patience, empathy and finesse. It is Brecht’s poetry rather than necessarily his politics that Butusov’s reading exploits, even though there are powerful moments of political expression too that pierce through the German song lyrics to bring about the resonance of contemporary Russia (the land in which it is easier to build an empire than get a mid-day meal). There are additional, bigger, more global questions too, contained in the deliberate juxtapositions between elements of the natural world and manmade contamination, all against the occasional backdrops of images of childhood innocence. A moment of pure romance framed by a perfect image of rain made of that Chinese staple – rice, finds its potent rhyme in an antithetical scene in the second half, when it rains again, but this time – empty tobacco packets. Butusov’s approach is thorough yet incredibly light touch. He merely opens up the piece and pulls out its heart, then lets it beat for itself. Using its musicality – which veers from oratorio and cabaret to jazz and dub – the piece imperceptibly wraps itself around the audience and pulls each individual spectator deep into its complex interior. Some are lost, some are curious, some are perplexed. But by the time Shen Te sings her last number – intended as her last defence in the divine court – some are easily roused to their feet too. The Good Person of Szechwan was on at Barbican Theatre from 8th-9th February. More info here.